Chi Chi’s used to have locations in the United States but now they only operate overseas. That doesn’t mean you can’t enjoy some of there Mexican dishes at home. Today’s secret recipe will show you how to make Chi Chi’s chicken chimi’s. These chimi’s are baked and not fried. Lay one flour tortilla on counter top. On the lower third of the tortilla, layer beans, cheese, chicken, cilantro, jalapeño, salsa and olives. Carefully fold the side of the tortilla closest to you over the top of the mixture. Fold in the sides next and then continue to roll. Place rolled burrito on the prepared baking sheet fold side down. Bake in the oven for 10 minutes, flip the burritos, brush again with butter and bake an additional 5 to 8 minutes, until the top is golden brown. Remove from the oven and allow to rest for 3 to 4 minutes. Transfer to serving plate and pour taco sauce over the top to serve. 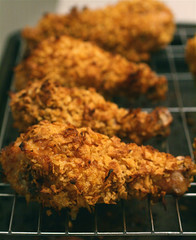 Today I have a secret recipe for Chi-Chi’s Old West Oven Fried Chicken. This chicken dish is flavored with a Tex-Mex twist and is baked in the oven for a slightly healthier alternative to deep frying. The result is a juicy chicken with a nice and crispy coating that isn’t greasy. Use crushed red pepper flakes in this recipe for a little extra kick. In a shallow dish, whisk together taco sauce, egg and garlic. In a plastic or paper bag, combine cornflakes, chili powder, cumin, oregano, ground cloves and crushed red pepper if using. Dip chicken pieces in sauce; toss in cornflakes mixture; place on a greased shallow baking pan. Drizzle with butter; bake 45 minutes or until golden and tender, and juices run clear. This recipe is easy to make using leftover chicken. Feel free to substitute cooked ground beef or chopped steak. Preheat the oven to 450 degrees F. In a large saucepan, saute onion and garlic in oil until tender. Stir in chili powder, salsa, and cumin. Stir in shredded chicken. Let cool. Grease rimmed 15 x 10 x 1 baking pan. Working with one tortilla at a time, spoon a heaping tablespoon of beans down center of each tortilla. Top with a scant 1/2 cup of the chicken mixture. Fold up the bottom, top and sides of tortilla; secure with wooden toothpicks if necessary. Place chimichangas in greased baking pan, seam side down. Brush all sides with the oil. Top with cheese. Bake 20 to 25 minutes or until golden brown and crisp, turning every 5 minutes. Serve with sour cream and guacamole. I’m back with yet another tasty quesadilla recipe. I remember as a child going to Chi Chi’s with my family at least once a month until they closed down the location near my house. Sadly, I have not eaten at Chi Chi’s since then, so I was so excited to find this copycat recipe for there Steak & Mushroom quesadilla. This was last nights dinner, and it was a success around the kitchen table. Enjoy! Salt, pepper, granulated garlic and fresh limejuice to taste. Marinate the steak for at least 2 hours prior to grilling. Grill steak to desired doneness. Remove the steak from the grill and slice thinly. Saute the pepers, onions and mushrooms in the garlic butter until the vegetables are semi-soft. Lay the tortilla on a medium heat grill or large pan. Top the tortilla with the cheese, Pico de Gallo, sauteed vegetables and the grilled steak. Allow to heat until the cheese has melted. Once the cheese has melted, fold the tortilla in half. Remove the tortilla from the heat and cut into four wedges. Place the cut tortilla on a large serving plate and serve with shredded lettuce, sour cream, guacamole and Chile con Queso for dipping. PICO DE GALLO Mix all the ingredients and chill.